Bobby Jaspar (20 February 1926 - 28 February 1963) was a cool jazz and hard bop saxophonist, flautist and composer born in Liège, Belgium. He was married to the jazz singer Blossom Dearie. At a very young age, Jaspar learned to play piano and clarinet. Later, he took up the tenor sax and flute. With the "Bop Shots" band, he took his first steps in the jazz world. 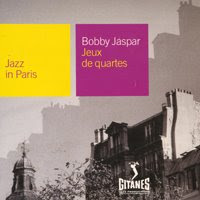 In 1950, Jaspar moved to Paris, playing and recording with the best musicians of the era. Here he met his future wife, Blossom Dearie. In the mid-fifties Jaspar was persuaded to try his luck in the United States, where his reputation in jazz circles had preceded him. He played and recorded with the quintet of J. J. Johnson, with Kenny Burrell, Miles Davis, John Coltrane, Toshiko Akiyoshi, Donald Byrd and many others. In 1961/1962, Jaspar returned to Europe for a year for a series of concerts and a number of recordings. With his colleague, Belgian guitarist René Thomas, he formed a successful quintet. In some sessions, this was expanded to a powerful sextet with American trumpeter Chet Baker. One of those sessions was immortalised on the record Chet Is Back, recorded in 1962. In February 1963, he died from a heart attack, aged just 37.